The Visual Arts Fund is a grant program established in 2016 by Midway Contemporary Art with generous support from The Andy Warhol Foundation for the Visual Arts. Minneapolis–Saint Paul is one of twelve metro areas included in Warhol’s Regional Regranting Program, which is aimed at promoting vibrant artistic activity in cities across the United States. In 2018 the Visual Arts Fund will award $60,000 ($5,000 and $10,000 grants) to artist organized projects in the Twin Cities metro region. 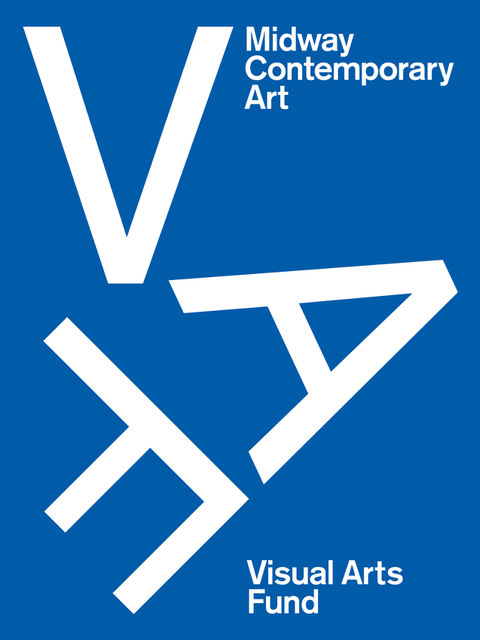 The VAF supports the development of projects and initiatives that engage the public with visual art. Proposals must name a lead organizer, but can include any number of artists as collaborators; individuals or groups may apply. The VAF program seeks to support a wide array of innovative and diverse projects that otherwise might not occur. The Regional Regranting Program, launched in 2007, aims to support vibrant, under-the-radar and self-organized artistic activity by partnering with leading cultural institutions in communities across the country. Midway is one of twelve organizations to host The Andy Warhol Foundation for Visual Arts’ Regional Regranting program, making funding available for artists in the Twin Cities metro area. Eleven additional programs have been developed and facilitated by organizations in Albuquerque, Baltimore, Chicago, Houston, Kansas City, Miami, New Orleans, Philadelphia, Portland (OR), Portland (ME) and San Francisco, each providing grants for the creation and public presentation of new work in their regions. Projects must function primarily within a visual arts context (rather than performing arts, music, literature, or other arts). Projects can have interdisciplinary elements, but must have a strong basis in the visual arts. A publicly accessible component of the project must take place within the Twin Cities seven-county metro region. Projects must be artist-organized and self-initiated; projects cannot be part of the programming of any nonprofit or commercial gallery. 501c3s, incorporated businesses, and students* are not eligible to apply (*PhD students are eligible). Projects cannot charge admission or other fees to the public or to participants. Projects cannot start before January 1, 2019, and must be completed by June 30, 2020. Lead organizer must live within the seven-county Twin Cities Metro region (Hennepin, Scott, Ramsey, Dakota, Anoka, Carver, and Washington counties); additional collaborators can live anywhere. Lead organizers do not need to be U.S. Citizens, but must have social security numbers in order to receive payment. Lead organizers may only submit one application per application round. Lead organizers and projects that received funding in 2017 are not eligible to apply for the 2018 grant cycle. If the project involves a group of artists working together, please choose one person to act as the lead organizer. This contact person will be responsible for receiving grant funds and overseeing the project. You may work with as many collaborators and /or artists as you wish. Information session locations are accessible to all visitors. ASL interpretation is available upon request with two weeks’ advance notice. Please contact us for more information, or to request specific accommodations. We have compiled a list of frequently asked questions from past information sessions and highly recommend that you read through them, especially if you are unable to attend one of the information sessions scheduled for the current grant cycle. These guidelines can be made available in alternative formats or languages. To accommodate your request, we will need two weeks’ advance notice. Grant recipients will be announced in mid-December. How does this project involve the work/practices of other individuals? How will you determine others involved? Where will the project ideally take place? What part of your project will be accessible to the public? Why is it important for this project to have Visual Arts Fund support? Please provide a short, narrative bio for your lead organizer, as well as your group or organization (max 100 words) and for key collaborators and artists (up to 5 bios, max 100 words each). Focus on experience relevant to this project. We will not accept CVs or resumes. Be realistic about your income and expenses. This program supports fair pay for artists. You are not necessarily expected to have income outside of the Visual Arts Fund grant, but please indicate it if you do. Your budget must show a zero balance between your Expenses and Income.